When Isabelle and I visited Abby and her family this summer she was in the throes of packing but was kind enough to dictate her formula for little baby sweaters. She knits them on number 1 needles using sock yarn. They are her version of E. Zimmerman’s percentage method. Abby even gave me the wool sock yarn this sweater is mostly knit from– on number two needles. Yes, there was a mix-up. Number two was in the air that day. It will fit someone older, though–a toddler. I did add a garter stitch border to the loser edge to keep it from rolling. Does not this pair of mittens look lovely? All done, finally, except for the last thumb. The first one was started in early December. 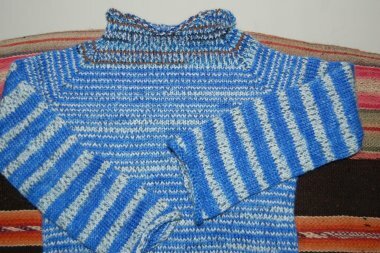 It was not until I finished it that I realized I had left off the 1 1/2 inch cuff above the ribbing. 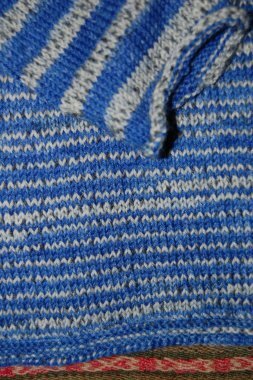 After cutting a thread and removing the K1P1 cuff, I added the cuff by knitting downward. That was the latter half of this week. The ribbing on this first mitten was completed this morning during a Sunday class on Justice, Mercy and Shalom. 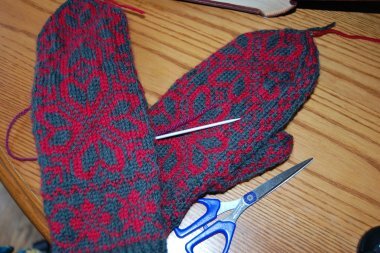 That left only the thumb on the second mitten to complete. Finally. Until, after lunch, as I sat listening to Car Talk, I noticed something. You will spot it much more quickly than I did. Oh, Blah. How could it be that I spent all those hours over weeks and not notice 2 left thumbs? 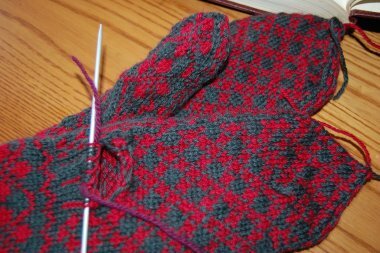 I decided to rip the second mitten back to the cuff and redo it with a right thumb. There has been a lot going on here the past few months. 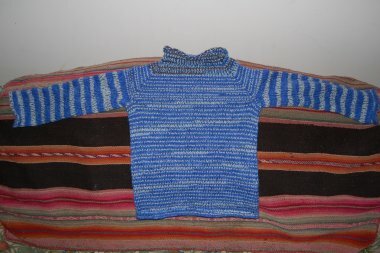 Maybe I can say that is the reason for so much going unnoticed so long in my knitting. I have been paying attention to other more weighty matters.